Crochetville are currently hosting their 5th annual NatCroMo Blog tour featuring 80 designers, crochet-friendly local yarn stores, indie dyers and spinners. There are free patterns and tutorials and daily giveaways too! Here's the link to general information on the CrochetVille website. You can see what's going on each day on the CrochetVille blog and their National Crochet Month Facebook group. The designers are my absolutely favorite thing about the Crochetville tour. I was delighted to see the inspiring Marie Segares kicking off the blog tour. 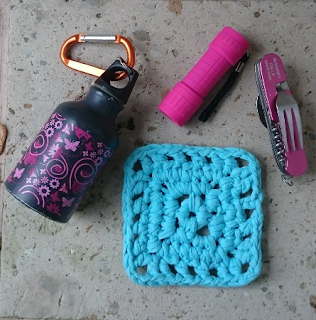 Of course I had to make the camping trivet (her free pattern for the tour) being a big fan of camping (and Marie!) Being the thrifty Brit I made my own tshirt yarn out of my daughter's old choir t-shirt. It's amazing to see how simply pulling the cotton tight rolls it into functional yarn. Here's the fab video on How to make t-shirt yarn that I found on YouTube by Trisha at Upcycled Stuff. I loved the projects by new-to-me designer Yuliya Tkacheva and figured out that she works in tandem at Cup of Stitches with Lena Fedotova, designer of the wonderful Entrelac Tunisian yoga top that I've just completed. I also discovered fellow Brit Amanda Perkins for the first time who designs the most beautiful crochet blankets. And the month is barely half way through! Thanks for the info re international crochet month... after I was saying on IG that we have no #natcromo in Australia that I know of; I must investigate! Gee, how long have Crochet Spot & Crochetville been going? The latter were pre-Ravelry and possibly pre-google. Sounds like #natcromo is a great learning opportunity so I must make the effort even though it is a very busy time for me in 'Mad March' in Adelaide. I was delighted to find the International Crochet Month party too Jodie. The party started on Ravelry back in 2007. You've got me doing a bit of research now on the timeline.... Google search started in the late '90s, Crochetville 2004, Ravelry 2007 & Crochet Spot 2009. March IS so busy for me too but I'm managing to check on #natcromo every few days! Hope you find some good stuff on there too! Enjoy! !